"Failure isn’t a necessary evil. In fact, it isn’t evil at all. It is a necessary consequence of doing something new." In Creativity, Inc., Ed Catmull, President of Pixar Animation and Disney Animation, recounts the founding and development of the animation studio that changed the film industry. Part nonfiction account of the history of Pixar animation and part memoir, Catmull's musing on creativity turns into a bit of a business how-to book. Much of Catmull's advice about creativity is not so much intended for the would-be artist, up-and-coming-dreamer, or creative person at large. Rather, Catmull wants to help large business managers better foster creativity within the workplace. Not expecting this angle, I nonetheless stuck with the book as I was curious to see which direction it took. Having just finished Elizabeth Gilbert's Big Magic: Creative Living Beyond Fear, I was interested to see what parallels the two books shared. The answer: very little. While Pixar's significance in making movies--the Toy Story trilogy, A Bug's Life, Monster's Inc., Finding Nemo, Up, etc.--is unrefuted, at times the narrative feels like an endless stream of humble-bragging. Though Catmull often points to mistakes the company made along the way, the moral of the story always seems to be the surprise of continued triumph with little negative costs. This felt most surprising when Catmull recounts an arduous nine-month period wherein the Pixar staff realized their draft for Toy Story 2 needed a complete reboot in order to heighten its emotional depth and drama. He recounts employees suffering from stress-related health issues, never seeing their family and friends, and truly horrifyingly the time an employee couple was so overwhelmed with their workload they forgot to drop their two-year-old child off at daycare and left the infant outside in their sweltering car for two hours. Yeah, totally disturbing. While the baby survived--thank heaven--and Catmull emphasizes the need to foster balance in the lives of his employees from here on out, the greater moral is the success of the film having been worth the tremendous sacrifice. This doesn't set well. Though it is obvious Catmull genuinely cares for his employees and this need for balance, his stories never get into the specific nitty-gritty of management to detail how you actually place limits on workloads and foster creativity while maintaining balance. In fact, most of the narrative from this point forward is about growth and an on-ward-and-upward mentality, but readers may be left with the picture of employees slaving away at their desks hour after hour. While perhaps we're supposed to infer that the workers love it--surely working at Pixar would be an animator's dream come true--this area felt too glossed over. Catmull credits the roles George Lucas, John Lasseter, and Steve Jobs each played in the success of Pixar and the way in which animation changed forever. His closing chapter discussing his friendship with Steve Jobs up to his death from pancreatic cancer is sincere and touching. "If you give a good idea to a mediocre team, they will screw it up. If you give a mediocre idea to a brilliant team, they will either fix it or throw it away and come up with something better." "Don’t wait for things to be perfect before you share them with others. Show early and show often. It’ll be pretty when we get there, but it won’t be pretty along the way." "If you aren’t experiencing failure, then you are making a far worse mistake: You are being driven by the desire to avoid it." 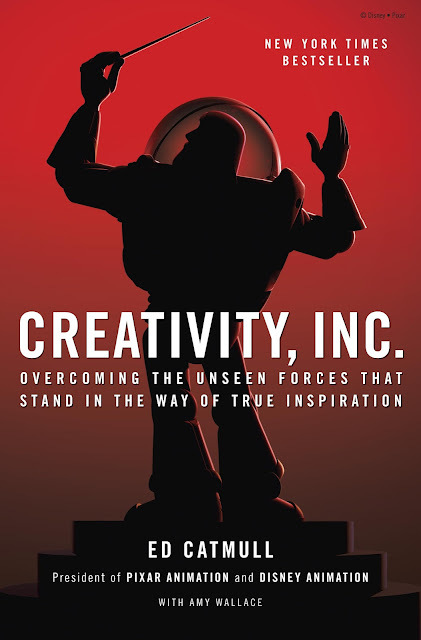 If you're interested in the rise and development of the blockbuster-producing powerhouse Pixar, then Catmull's book provides a detailed look at the successes and missteps the company faced along its path to worldwide dominance. If you're interested in hearing how you can enhance creative expression in your personal life or smaller-scale profession, this book is likely not for you.